Ricotta roast chicken The English have never really been famous for their food. But we are, after all, English, and proudly so. In the same way that the English countryside, through all four seasons, is as magical as anywhere on Earth, and where we feel most at home, so too do the iconic English dishes instil in us a sense of peace, of home, of warmth. And what could be more English than the perfect roast chicken. There is nothing that says coming together for good home cooked cooking as a roast chicken does. The enticing comforting smells of a roasting bird, crisp and golden coming out of the oven, with its collected juices- its nostalgia and everything right in a meal. Everyone has their own way of cooking theirs, and we are sure that everyone is mostly right. There are so many different ways to roast a chicken, it takes on so many diverse flavors; complimented by all herbs and spices. Its one of our number one staples when cooking for the shoots we work on, its what everyone loves. The classic roast chicken is something that everyone should have up their sleeve, its always a crowd pleaser and saves the day. 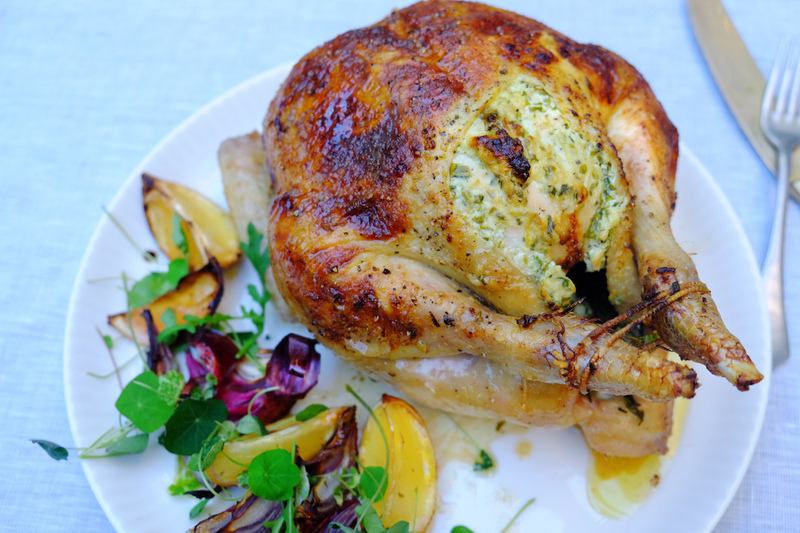 This recipe adds an exciting twist to your classic roast, making a delicious ricotta herby stuffing, with the winning tarrogan- one of chickens best friend .The sensation of getting your hands beneath the skin and getting your mix all around the bird, lifting the skin as you go, feels slightly thrilling and a little wrong. But prepping a chicken is all about getting your hands in there and getting messy! Its what makes it so tasty. Preheat your oven to 220ºC. Rubs your chicken inside and out with salt and pepper mix in a bowl the ingredients from ricotta down and season. Lift the skin of your chicken, making sure not to tear, stuff your mixture all around the bird, if you can lift the skin and get the ricotta down to the legs by pushing it through do. Put half a lemon into the cavity, with extra garlic gloves. Rubs the chicken in olive oil and place into the oven for around an hour and 20 min, reduce the heat to 200 after 40 mins. When you take out make sure to let the chicken sit for a bit, will bring all the flavours together.